A federally funded research project is releasing details about the effects health inequalities can have on members of the LGBTQ community as they age. The project, titled Aging with Pride: National Health, Aging, and Sexuality/Gender Study, is researching the lives of 2,450 50 to 100 year old LGBTQ Americans. It is an ongoing study, operated by the National LGBT Health and Aging Center. This study lines up with a CDC study, titled Healthy People 2020, which uncovered health disparities based on stigma, discrimination and violence faced by LGBTQ people. Aging With Pride takes it a step further, showing that all of these can get worse as people age. 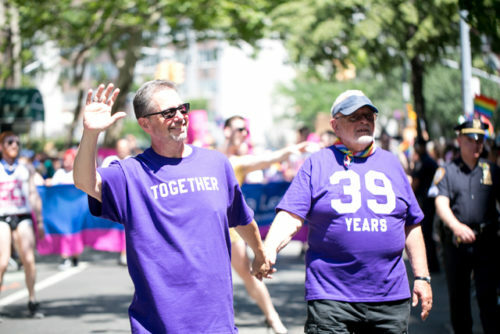 Some of the key findings in their report include a higher rate of both disability and mental distress compared to older heterosexuals, a higher incidence of cardiovascular disease and obesity in older lesbian and bisexual women, and a higher incidence of poor physical health — and living alone — for older gay and bisexual men. What’s more, many of the study’s participants have faced serious adversity, with 68% experiencing verbal harassment, and 43% facing threats of violence. On top of this, many also report a lack of access to care, including 22% of older transgender people not being able to afford medical care, while 21% of all respondents not disclosing their sexual or gender identity to their doctor. “We’ve found a constellation of high-risk factors, including a history of victimization and not getting access to the services they need,” said Dr. Karen Fredriksen Goldsen, one of the primary researchers for the study quoted in a release from the American Heart Association. The project was funded via a federal grant from the National Institute of Health (NIH) and the National Institute on Aging (NIA), and is a collaboration of 17 community agencies serving older LGBTQ people across the U.S. The agencies involved cut across a broad swath of demographics, allowing the project to look deeper into disparities amongst specific subgroups in the community. For example, older LGBTQ African-Americans are more likely to deal with obesity and high blood pressure, while older LGBTQ Asian/Pacific Islanders face a higher incidence of visual impairments. On the surface, the data may paint a bleak picture, yet not all the news is bad. The findings also showed that older LGBTQ people are more resilient, with 91% engaging in wellness activities, and 89% feeling positive about belonging to the LGBTQ community. On top of this, the elder community includes a higher focus of caring for each other. Both older LGBTQ women and men assist in care giving, and are more likely to report a disability, depression victimization, or abuse. The report says there are roughly 2.7 million LGBTQ people 50 and older in the United States, including 1.1 million age 65 and older. Their ranks are expected to nearly double by 2060. The study remains ongoing, and has recently expanded to study dementia and other issues not initially explored.